Spider-Man Studies. 2010. Ink on bristol board, 11 × 17″. I wasn't the only one who was taken by drawing. While flipping through classic Spidey issues some years ago, I came across a familiar pose. 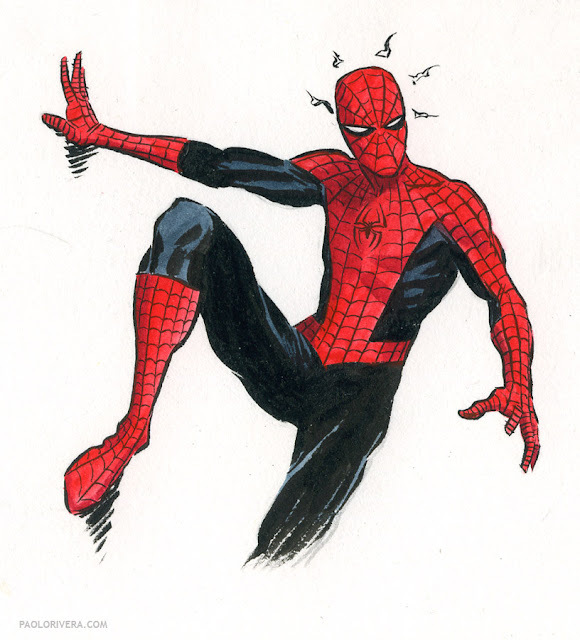 It turns out that Art Adams copied the pose himself from the original Spidey master, Steve Ditko (and it wasn't the only copied pose in the issue). Needless to say, I still have nothing but respect for Adams, whose depiction of Spider-Man has had the most influence on me (at least from that dog-eared issue). It's just nice to know that even the masters weren't born fully-formed. "Extra credit" if you can tell me what issue of Amazing Spider-Man the pose appears in. Tomorrow's Wacky Reference Wednesday will feature my character studies for Peter Parker, including some hairstyle revisions via Joe Quesada. It took a complete perusal of Ditko's run on AMS to find the source, but I've identified the original as panel 4 of page 8 of issue 35, "The Molten Man Regrets." 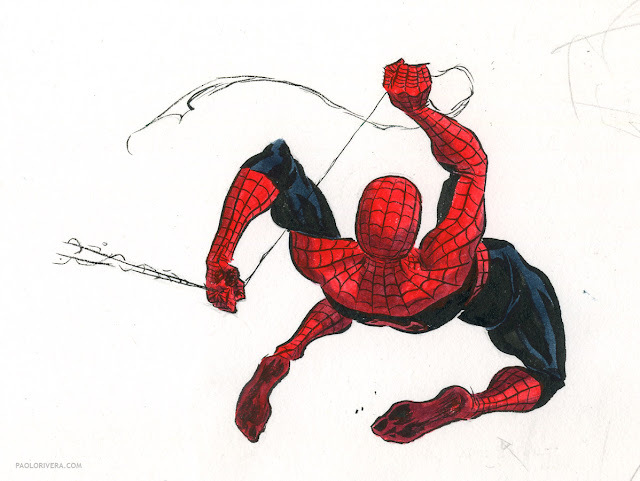 It's a great pose of Spidey, and I can see why Arthur Adams quoted it. Well done! There are 2 more quotes on pages 6 and 7 as well. Ditko invented nearly every Spidey pose out there, so I can't blame Adams too much.